Arlington Heights Julio 4 Arlington Park Race Track Fuegos artificiales incian "al anochecer". Las primeras 10,000 personas recibiran lentes de 3D. Barrington Julio 4 Barrington High School, en 616 West Main Fuegos artificiales incian "al anochecer". Bartlett Julio 4 Apple Orchard Park Fuegos artificiales inciana las 9:30 pm. Bridgeview Julio 3 Commissioners Park, en 8100 S. Beloit Fuegos artificiales incian "al anochecer". Calumet City Julio 3 Superior Street Complex, T.F. North High School, at 755 Pulaski Road Conciertos: 6:00 Euphony, 6:45 Jamiah Rogers & The Red Machine, 8:00 Final Say Fuegos artificiales 9:15 p.m.
Chicago Julio 4 Navy Pier 9 p.m.
Chicago Heights Julio 3 Bloom High School, at Chicago Road y 10th Street. 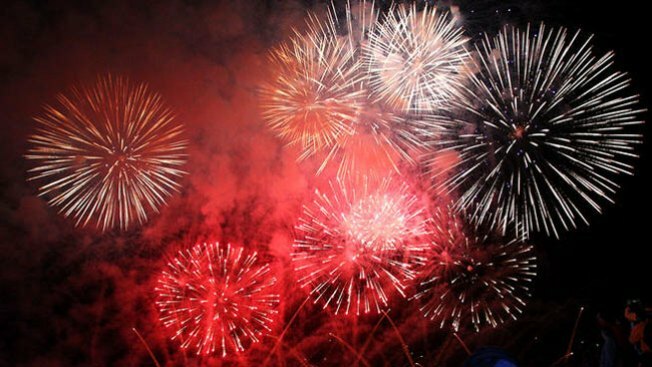 Fuegos artificiales 9:00 p.m.
Deerfield Julio 3 Brickyards Park 9:15 p.m.
Elk Grove Lions Park, en Lions Drive and Elk Grove Blvd. Evento inicia a las 6:00 p.m., fuegos artificiales 9:15 p.m.
Evanston Julio 4 Desde la playa de Clarck St. Fuegos artificiales9:00 p.m.
Lake Forest Julio 4 Deerpath Community Park Puertas abren 5 p.m. Boletos --$10para residents, $15 para visitantes. Glencoe Julio 4 Glencoe Beach Musica 7:00 P.M., Fuegos artificiales 9:00 p.m.
Glenview Julio 4 Glenview Park Golf Club—800 Shermer Road Concierto 7:30 p.m.
Hoffman Estates Sears Centre Arena—5333 Prairie Stone Parkway Fuegos artificiales 9:30 p.m.
Mt. Prospect Julio 4 Melas Park Fairgrounds—1326 W. Central Road Fuegos artificiales al anochecer. Northbrook Julio 4 Velodrome—Maple Ave. Fuegos artificiales al anochecer. Oak Lawn Julio 4 Richards High School-- 10601 S. Central Ave.
Orland Park Julio 4 Centennial Park Fuegos artificiales al anochecer. Palos Heights Julio 3 Memorial Park by City Hall Fuegos artificiales al anochecer. Park Forest Julio 4 Village Green on Main Street Fuegos artificiales al anochecer. Rolling Meadows Julio 4 Salk Park Fuegos artificiales 9:15 p.m.
Skokie Julio 4 Niles West High School Fuegos artificiales al anochecer. Millennium Park - Un concierto dirigido por Christopher Bell empieza a las 6:30pm. Chicago History Museum – Desfile de disfraces de niños con el Uncle Sam más alto del mundo de 10:00am hasta medio día.